Apple pie, apple crisp, apple anything- that is what I LOVE! When I crave an apple dessert, here are my tips for reducing the calories while keeping it delicious! Melt the oil over medium heat. Mix together the orange juice and cornstarch until dissolved. Sprinkle cinnamon over the apples and toss to coat. Place the apples in the pan and allow them to cook for about 10 minutes, while stirring every few minutes or so. Add the cornstarch/juice mixture and gently stir apples. Increase heat to medium-high and allow the apples to cook another 5 minutes while continuing to stir often. The cornstarch is a natural thickener so your apples will create a natural syrup. Place apples in an 8×8 pan. 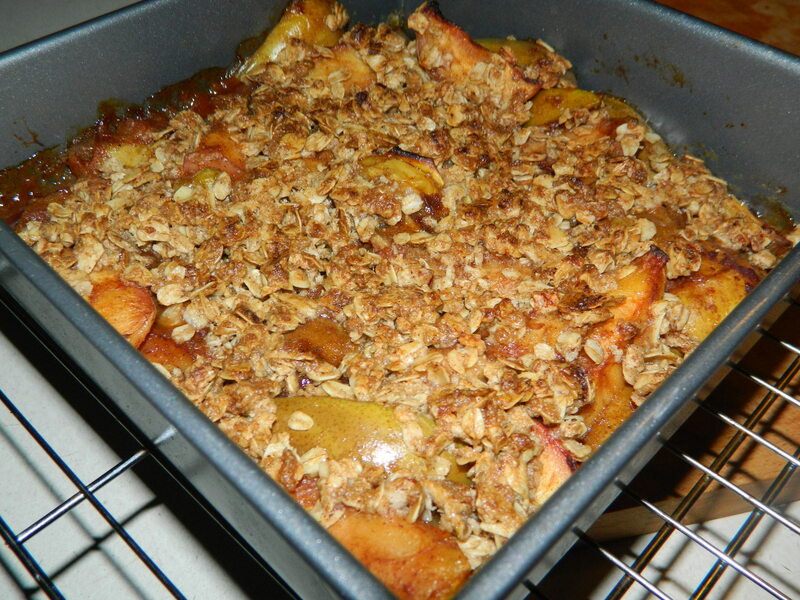 Sprinkle apples with crumb topping and bake at 350 for 30 minutes or until brown and bubbly. For the topping, mix the ingredients in a medium bowl and work together with your fingers until the ingredients are moist and crumbly. *If you want a pie, pour the filling into a Wholly Wholesome Pie Crust and bake an additional 10-15 min.